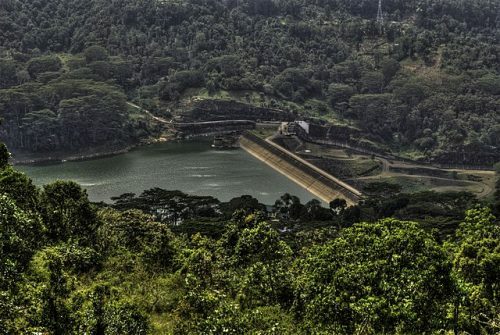 The Kotmale Reservoir in Sri Lanka is situated in the central hill country, between mountains and waterfalls, with lush greens around it. This is where the upper Kotmale hydropower plant is located. It is situated between Talawakele and Nuwara Eliya. With a capacity of 800 000 cubic metres, this is the 3rd largest hydropower plant in the country. The reservoir helps out the many villages and estates around the vicinity by making sure they are supplied with plenty of water, be it for plantations or daily human lives. Spread among lush green hill country, this an eye-catching sight often included in most tour packages exploring the hills of Sri Lanka such as those offered by local agents. Many Nuwara Eliya bungalows are located around the reservoir the likes of Mas Villa and others. The hill country is a beautiful place to be in, and to enjoy the most of it, choose to stay at a hotel that offers great views of the misty hills.